Brian’s first hot rod was a 455, 4-speed Trans Am. “Wow” is right. It was given to him by his father on Brian’s eighteenth birthday. But the real gift wasn’t just a car. A torch was passed on that fateful day. Brian’s passion for performance cars began right then and there, and eventually lead Brian to here and now. Mercury Charlie’s fourth bay, where primer yields to the will of a man who has developed a master’s touch. Brian has been called a natural. But it has actually taken him years to ascend to this level. 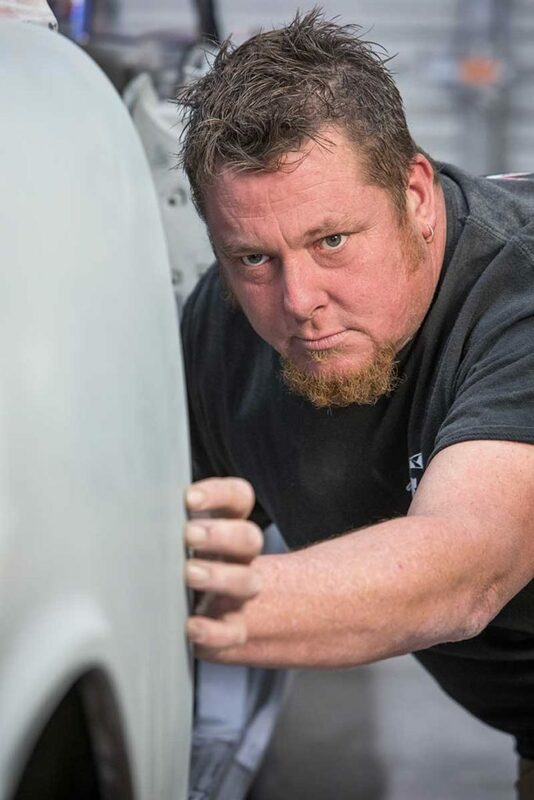 For every Brian Davis, there are a thousand regular Joes, who lack the time, talent, and determination to make automotive bodywork their true calling. Just ask any automotive paint rep who’s ever seen Brian’s handiwork and they’ll tell you that the man is a bondo salesman’s worst nightmare. The proof is in how little product he leaves between panel and paint. Watching Brian work a panel is like listening to a Lennon and McCartney song. Man and metal exist in perfect in harmony. The car tells Brian what it needs and Brian responds with a level of precision you’d sooner expect from a safe-cracker. Leaving as little evidence behind as possible is Brian’s modus operandi. Most body and paint guys never reach this level. But Brian has. We’d love to have you come by and take a look at his automotive bodywork before its bathed in one of his stellar paint jobs. Although in all fairness, that’s pretty damned impressive, too. You’ve simply got to see it to believe it. Please do.